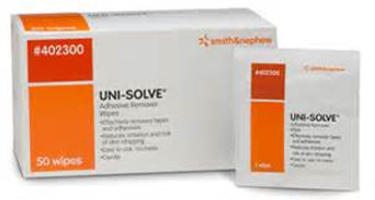 Uni-Solve Adhesive Remover is formulated to reduce adhesive trauma to the skin by thoroughly dissolving dressing tape and appliance adhesives. It is ideal for removing acrylic-based, rubber-based, and hydrocolloid-based residues from the skin. Contains Aloe to soothe and moisturises skin without greasiness.